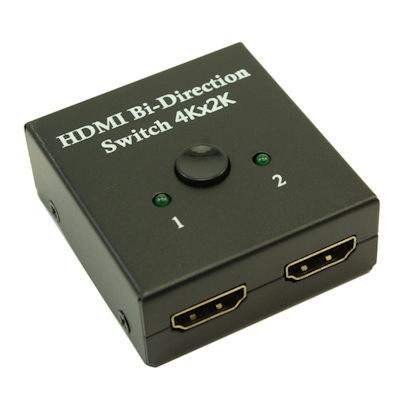 The 2 x 1 4K HDMI switcher routes high definition video (in multiple resolutions up to 4K@30Hz, but also supporting 1080P) and digital audio from any one of the two sources to 1 display unit. Two inputs accommodate the simultaneous connection of up to two high definition video sources, such as satellite, cable box, and BlueRay players. The output sends the high definition audio/video signals to a high definition HDTV display. Switching is done via it self automatically when signal present on the ports OR by depressing the top button. 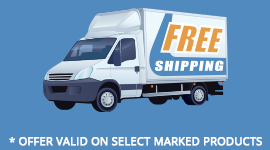 NOTE: Some devices are not fully compatible with the auto-switching feature as even when the device is powered OFF, it continues to output a video signal. Switch works WITHOUT a power supply to HDMI cable lengths of 25ft. This switch is also BI-DIRECTIONAL, meaning that you can use is in REVERSE attaching the SOURCE video to the OUTPUT port, and the 2 TVs to the INPUT ports and act as an HDMI VIDEO SWITCHER. Only ONE TV will display at a time, however. 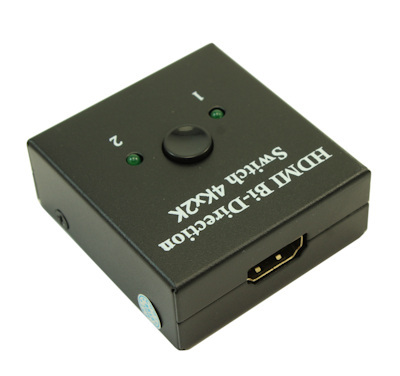 Can be used in REVERSE: 1 HDMI source, switch between 2 HDMI Displays.